I thrive when I’m surrounded by calendars, sticky notes, and to-do lists. The more that’s scheduled, the more I accomplish. A free day can easily become an unprofitable one. But when it comes to studying Scripture, I’ve discovered that planners are the last thing I need. If it’s scheduled, it’s routine. Only an item to be checked off the list. My first encouragement to anyone looking for a fresh approach to Scripture study is to set aside the Bible-reading plans. While there are many commendable methods out there, try something a little different and see if it doesn’t give you a strange and unparalleled perspective. An eye-opening and transforming one. My suggestion is to choose a small book of the Bible, or section of a book (maybe 5-10 chapters), and focus on it for a couple of months. Read the entire passage weekly. By simply seeing the same things over and over, discoveries are made. It doesn’t take much work. Maybe an hour a week and a little thinking, and all of a sudden, things appear that you’ve never noticed. The dots start connecting. Questions are answered. The Bible truly comes alive and keeps you wanting more, like the cliff hanger at the end of a captivating novel. To make it even better, start the study with a friend. Meet regularly to compare notes and share findings. You think the Bible is boring? You haven’t talked through parables, drawn goofy pictures, retold narrative, created charts and lists, and started making connections everywhere you turn. When you have your own code language thanks to a book of the Bible, it gets fun, folks. Another reason why I say the journey is a blast. The furthest thing from drudgery. There’s more to the excitement, but this is your starting point. Who says you have to read through the Bible in a year? Are you understanding it as you read? Are you eager to find out more? Are you making sense of some of the “mystery” of the Word? Is it taking you somewhere? Feeding you? Empowering you? Giving you breath? Then maybe speed-reading four chapters a day for a year and checking it off the list isn’t the most effective path. Quality is better than quantity. 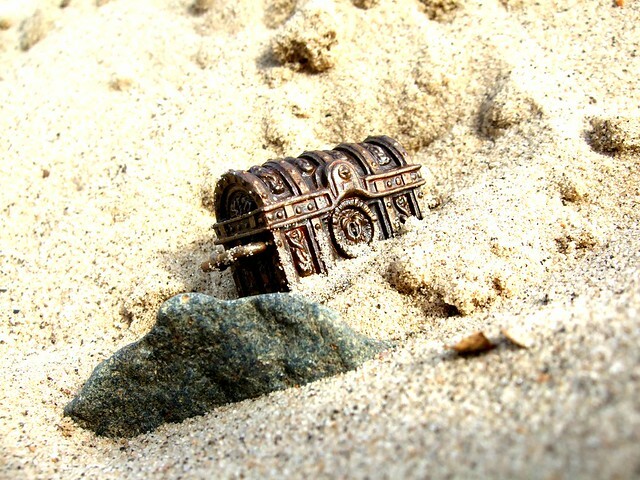 You could walk right over a buried treasure and never know it’s there. You could scratch the surface with a simple spade and never sense the greatness that lies beneath it. The most glorious Treasure in all the world lies in sixty-six books at your fingertips. Go at it persistently with an earth-mover, and don’t look back until you find all the depths of wisdom and knowledge which are hidden there. It’ll leave you humbled. And in utter amazement at the One who gave it. It’s kind of in response to, “Who says you have to read the Bible in a year?” . . . the typical “Bible reading plan” suggestion. “You could walk right over a buried treasure and never know it’s there. You could scratch the surface with a simple spade and never sense the greatness that lies beneath it.” Nailed it. It is a buried treasure, isn’t it? And no matter how many times I read a familiar verse, there’s always some gem buried deep in there — I love that the most!